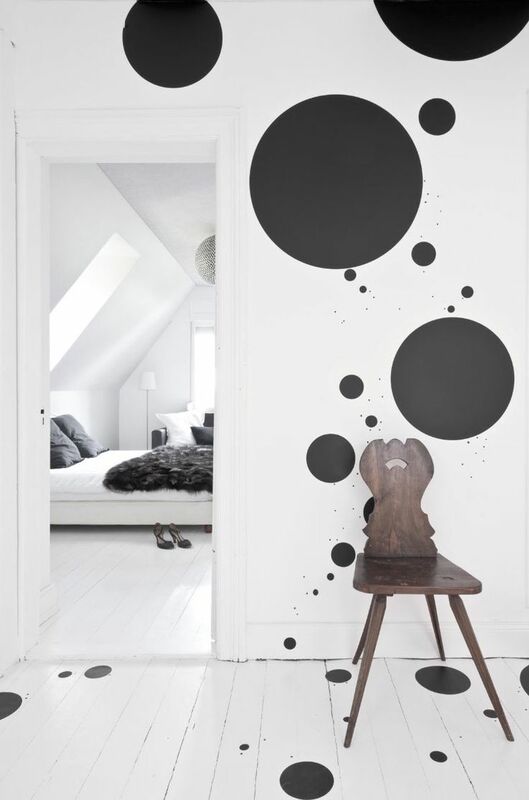 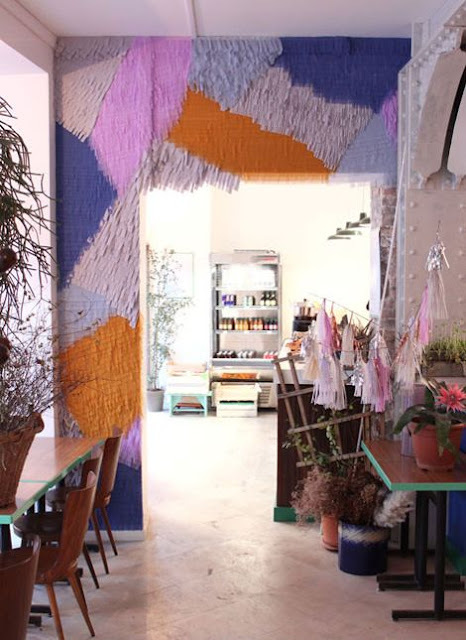 ANNY&: No more boring walls! 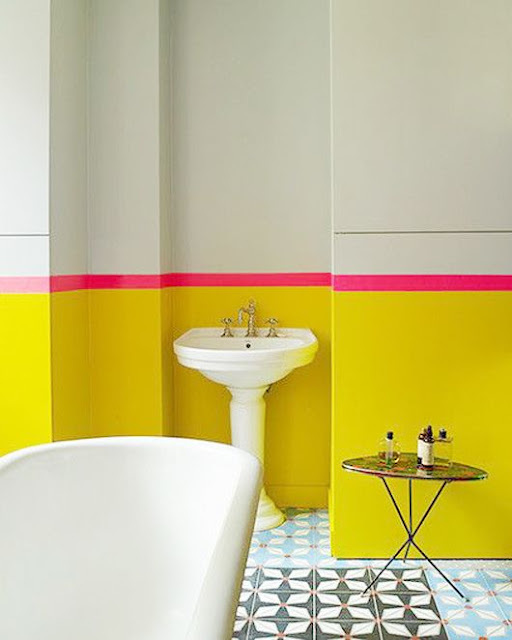 Another blogpost on colour... you might think we have a thing for it ;) I guess that is just the truth! 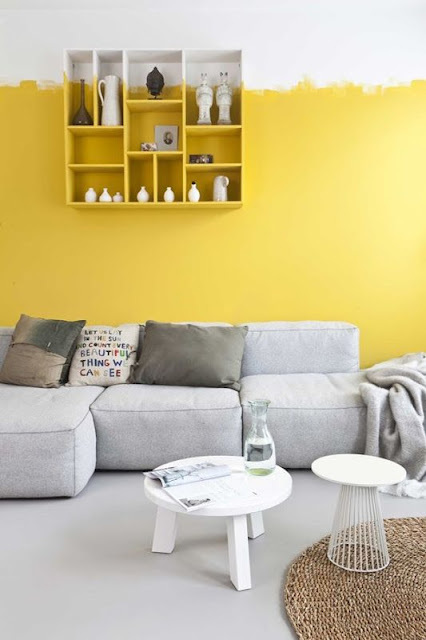 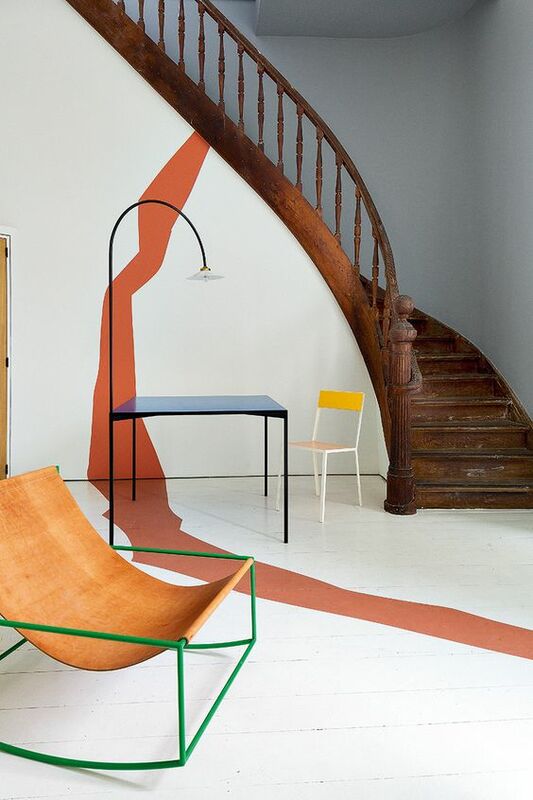 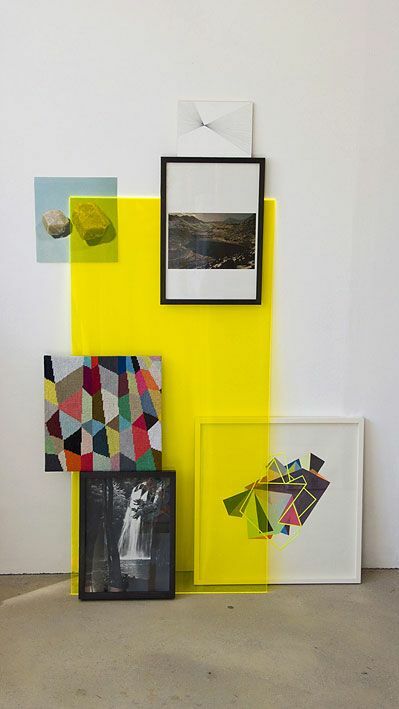 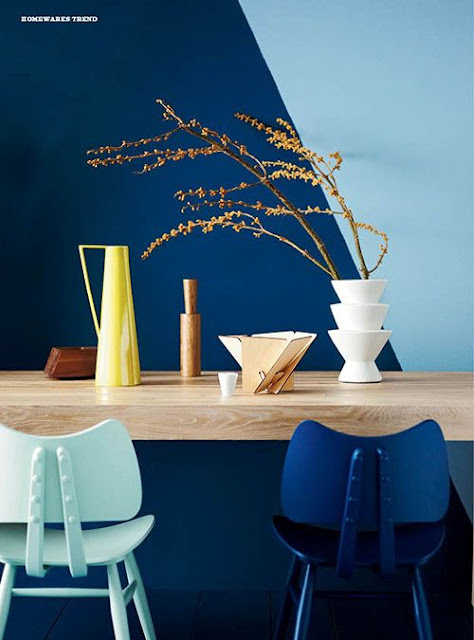 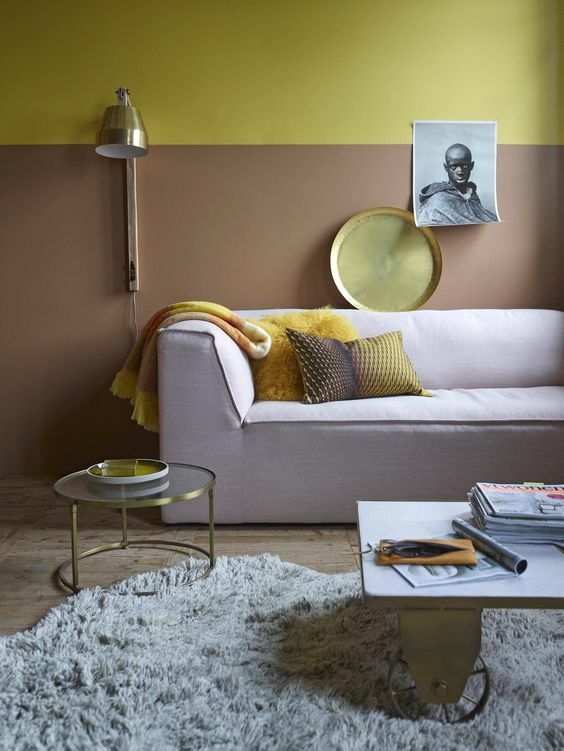 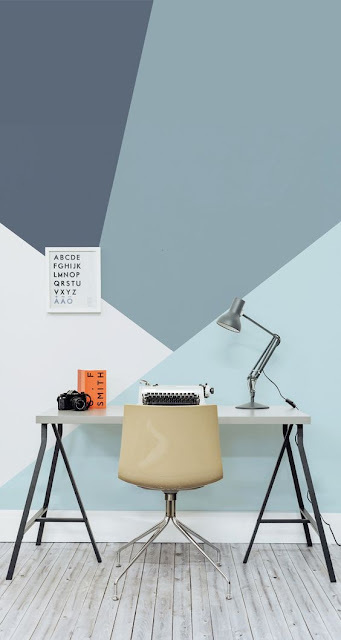 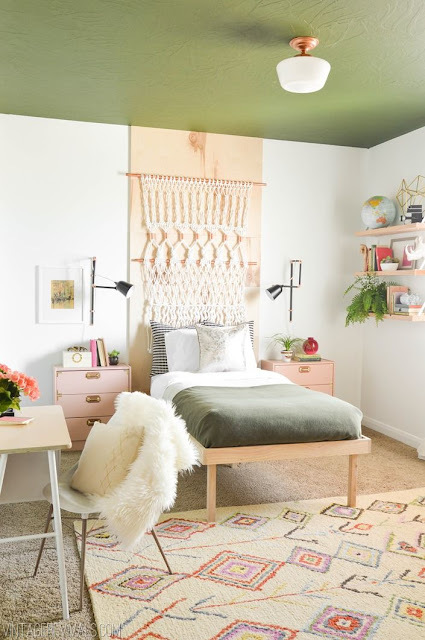 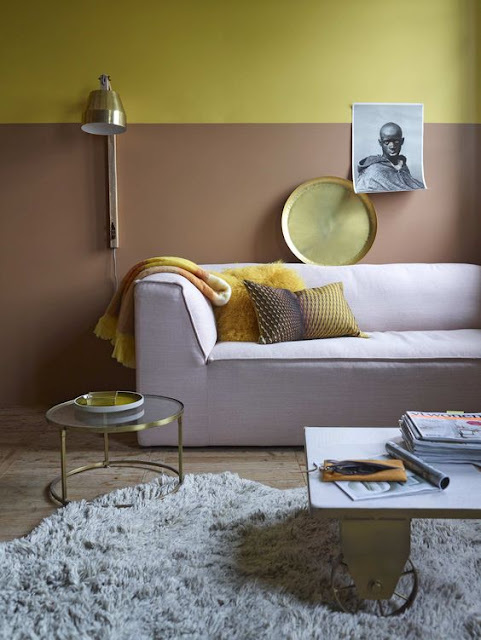 And we try to get you along ;) We have been inspired by all these great pictures we see of coloured walls, so here is an overview for you with loads of inspiration to make sure your walls will never be boring anymore! 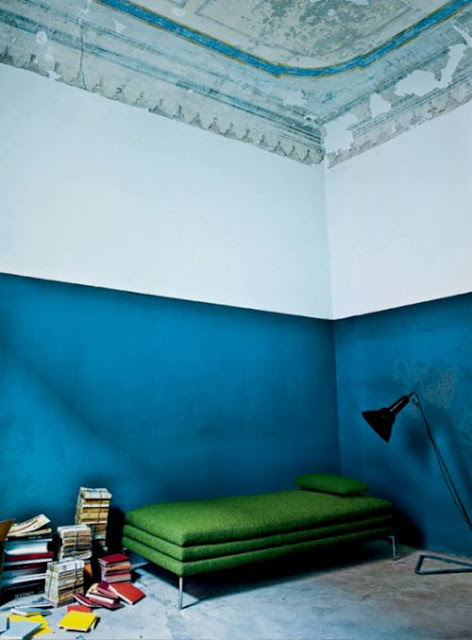 You call it a trend I guess, two toned walls. Or the revival of the wainscotting ;) It is all about painting half a wall in colour. This gives a great boost of colour to your interior, without making a room looking dark for instance when you use an intense colour. 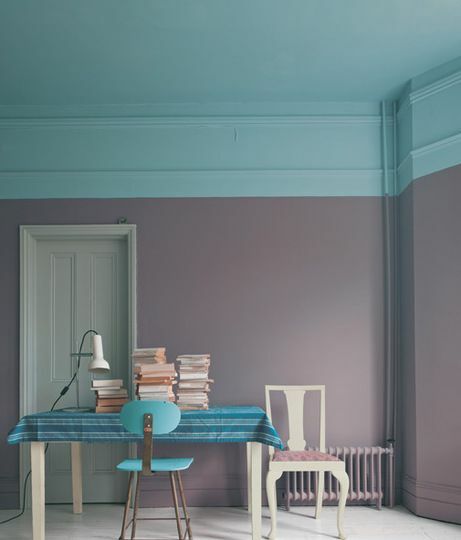 If you add an extra line in an accent colour it pops even more. 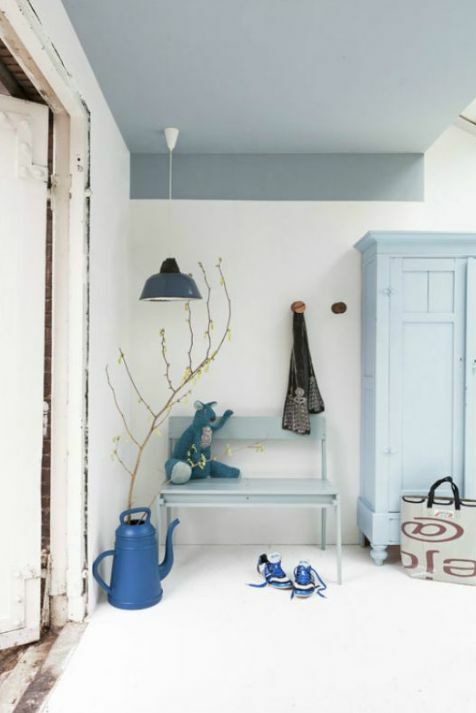 Painting cupboards, shelves and paintings in the same way, gives it an extra fun factor. 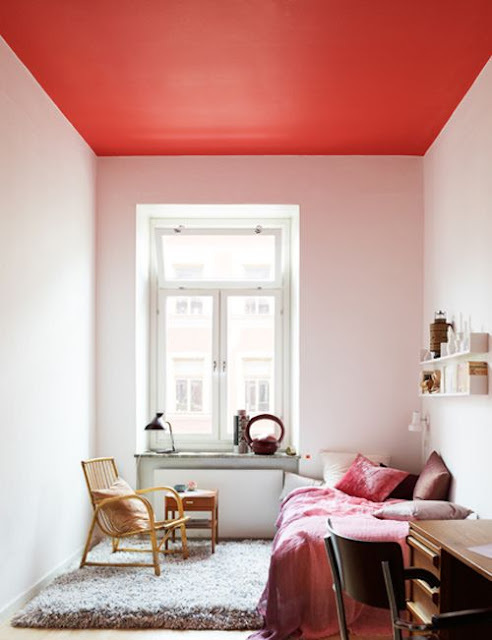 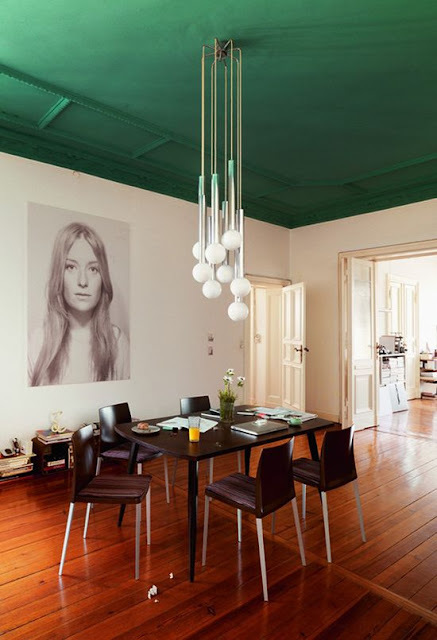 Painting your ceiling makes a room very special (do it when your rooms are quite high, otherwise it makes the room feel really small) You can combine the colours with those on the wall, or just paint only your ceiling. A wow effect is almost guaranteed! 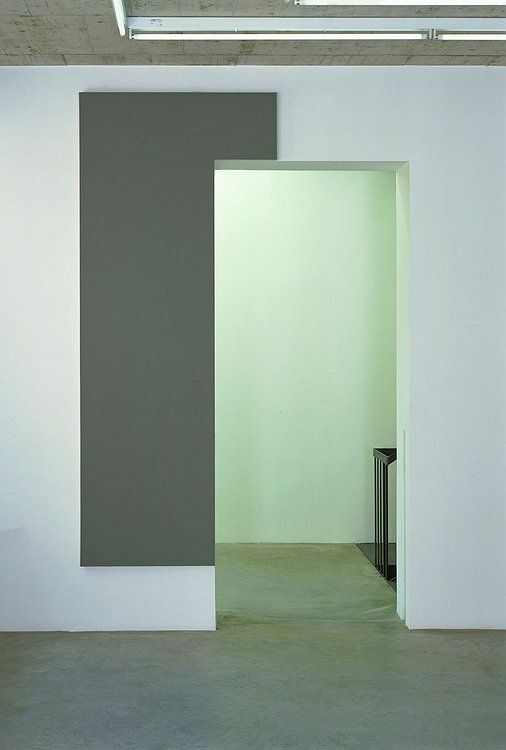 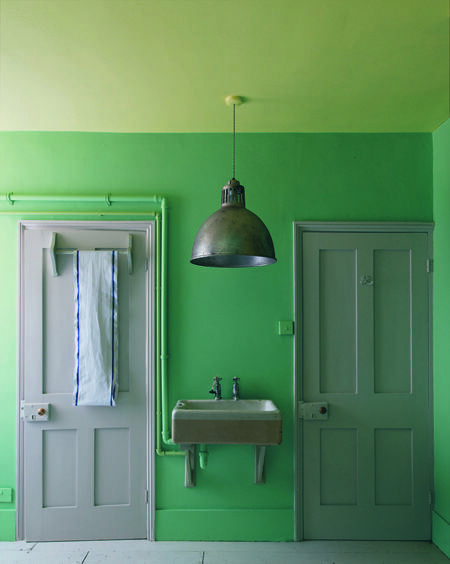 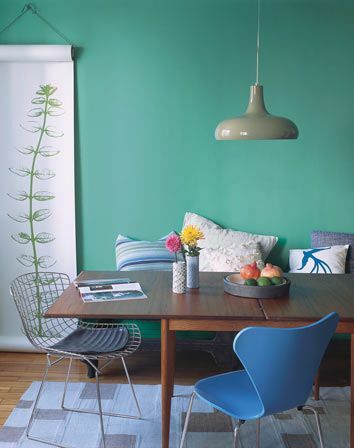 You can choose to paint part of the wall in the same colour, be creative. 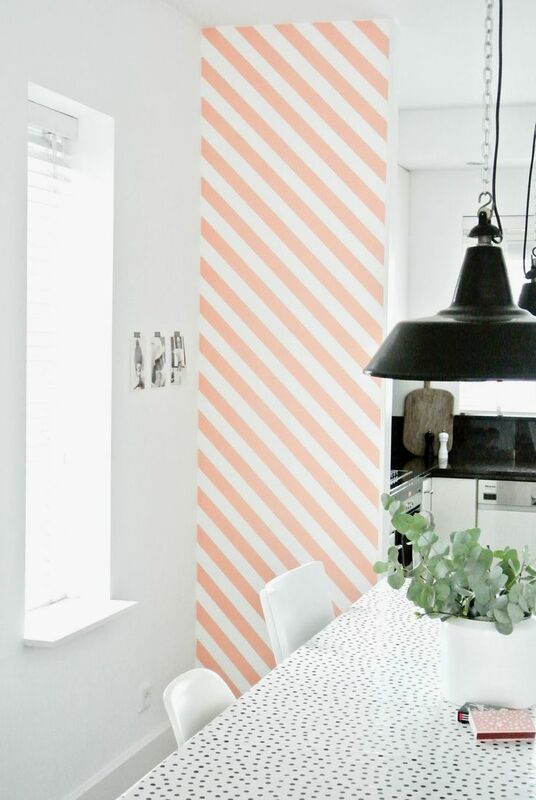 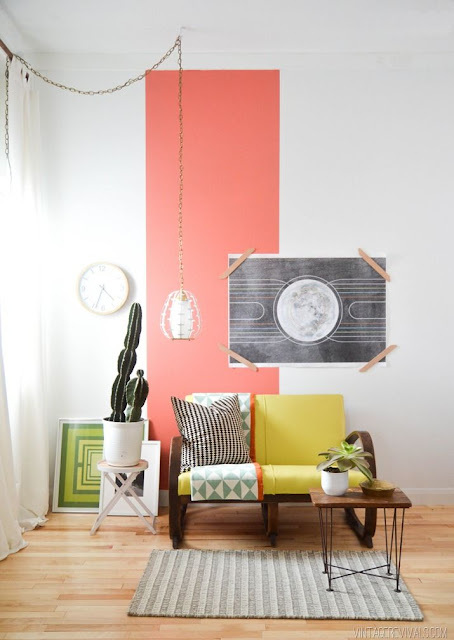 Is a two-tone wall too boring for you? Then make a mural in the modern way. 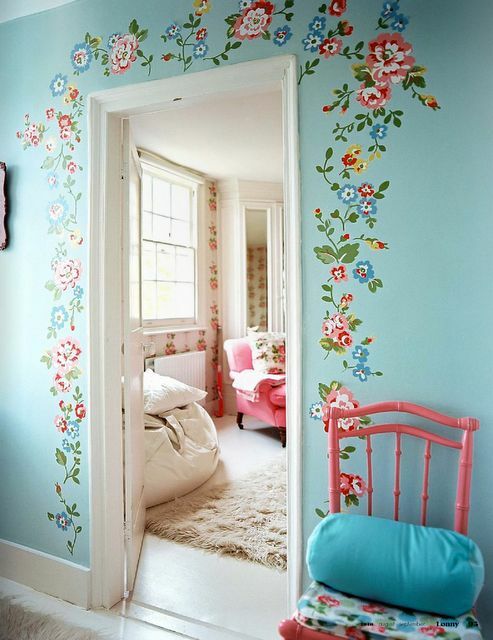 You can choose for instance from geometric patterns, dots, the 'unfinished painting' look or florals. 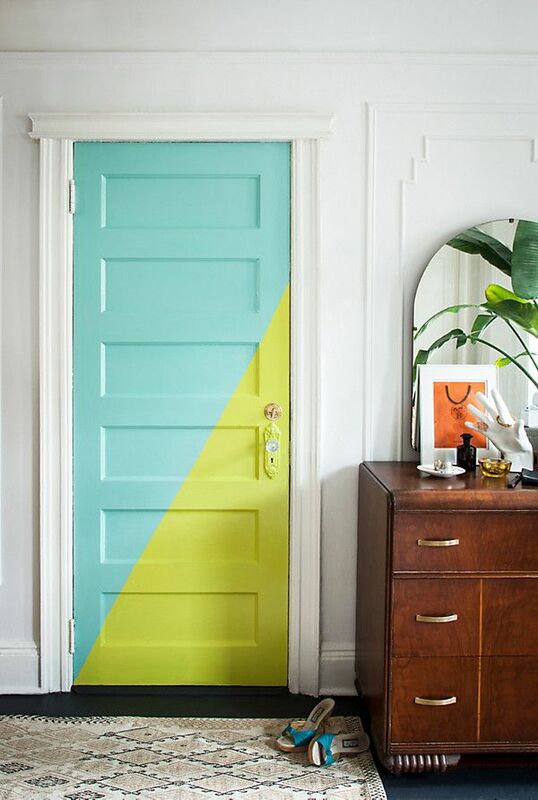 Use one colour or combine a few... whatever you want :) A nice accent is painting something around a door frame, that makes it more special and a focus point in your interior. 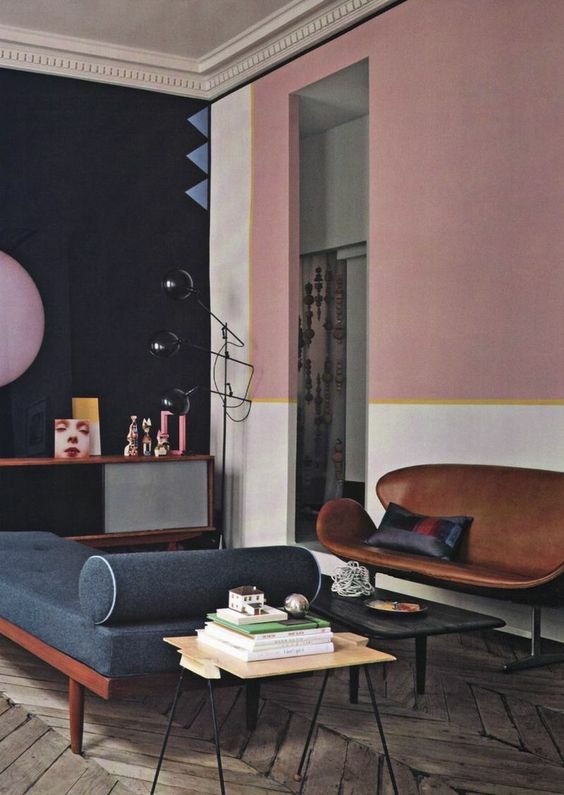 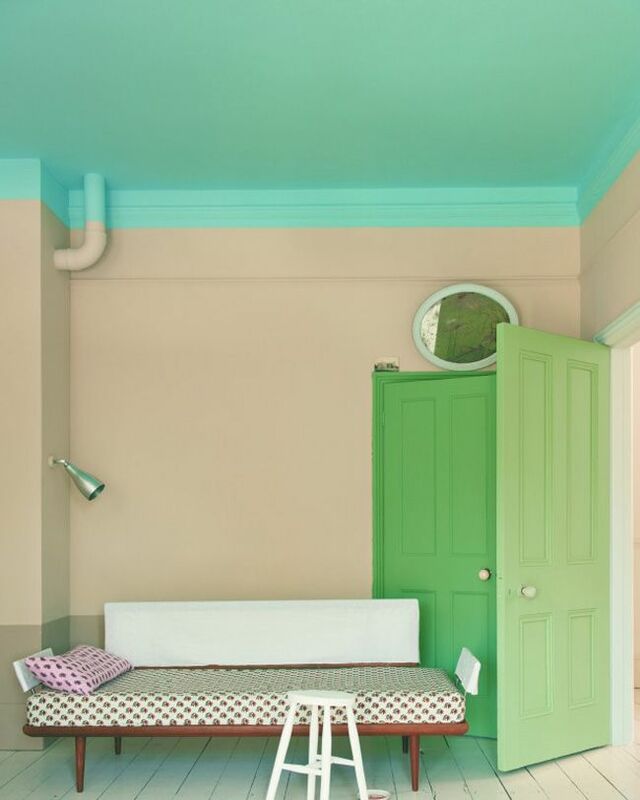 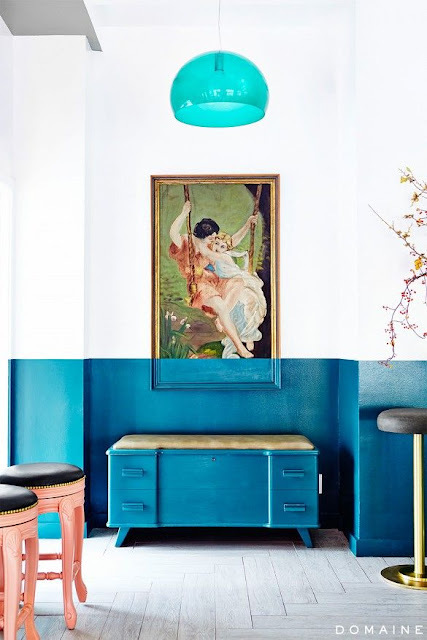 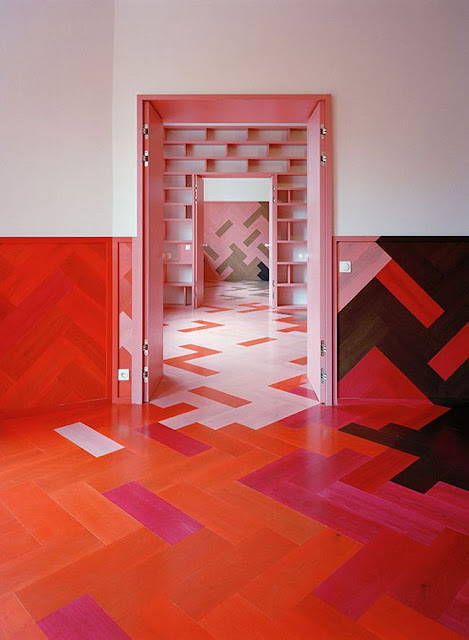 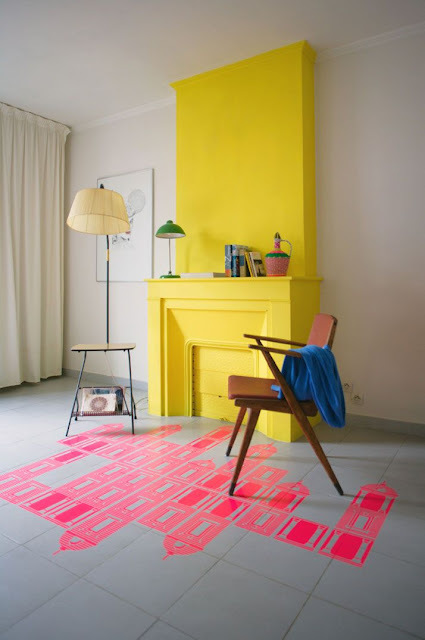 Of course you can use colour to makes accents in your interior. 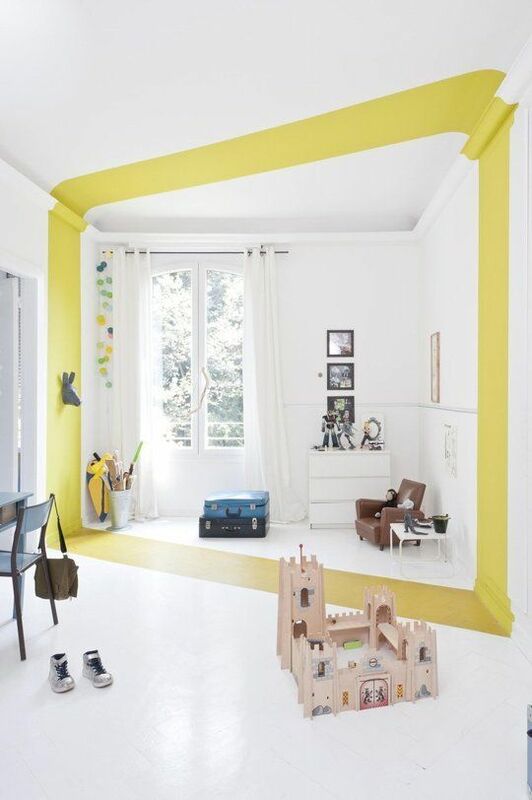 Be playful and creative! 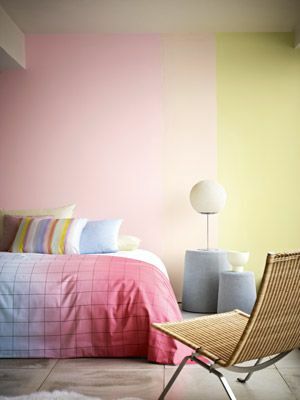 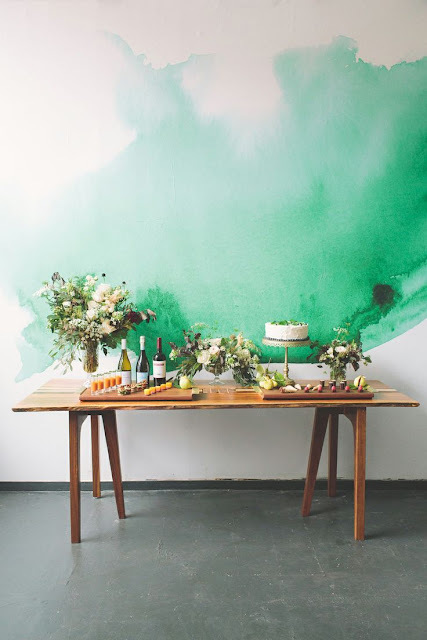 Here are some examples how you can make a room special with just a few strokes of colour. 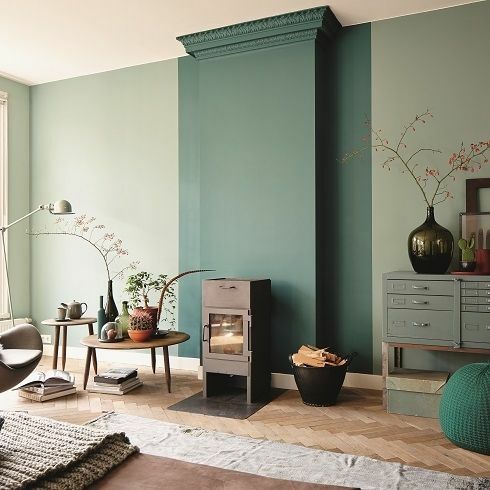 Use it to accentuate certain elements in your room, like a doorway or your fireplace. 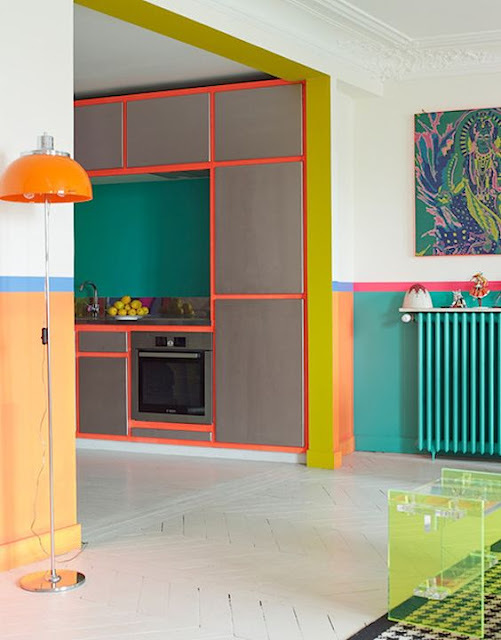 If you want to change your colour often, or want to move it around your home you can make coloured panels. 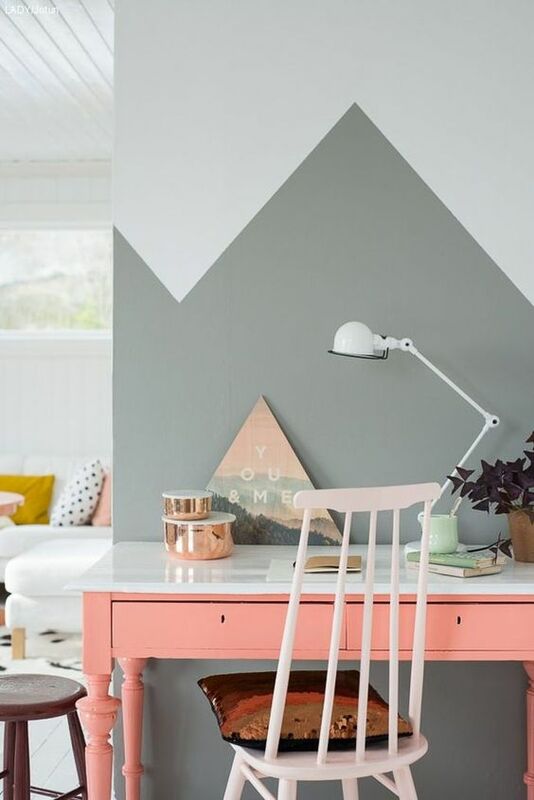 You can even paint them on both sides, or use different materials to play with texture in your interior at the same time. If you make panels out of fabric, this will also improve the acoustics in your room. 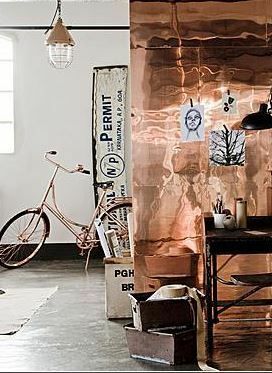 You can also use a semi transparent material, this gives an extra dimension when the light shines on it. And you can use them to separate parts of your room, without blocking the view. 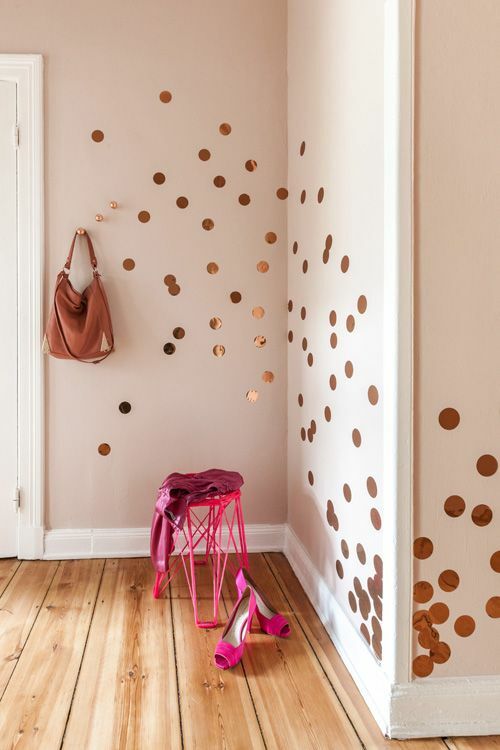 Add some confetti or fringes to make a happy wall.... it is such a wall that makes you smile every time you pass it! 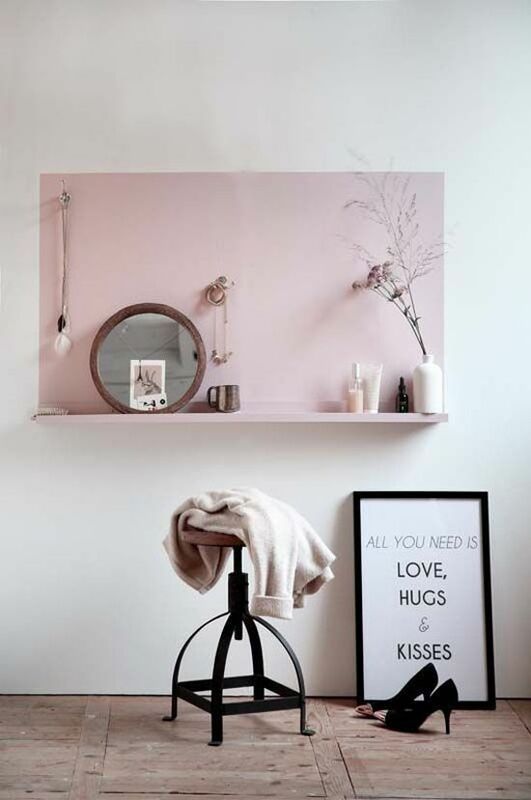 A good way to start you day or make you instantly happy when you get back from work. Hopefully we gave you enough inspiration to create your own great wall. 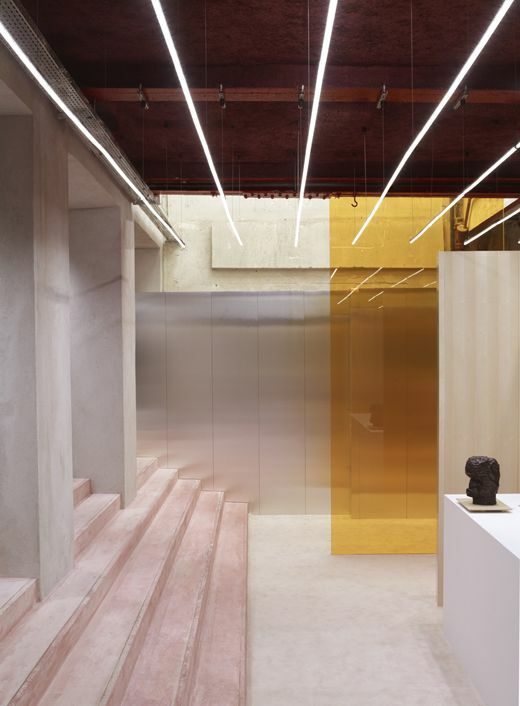 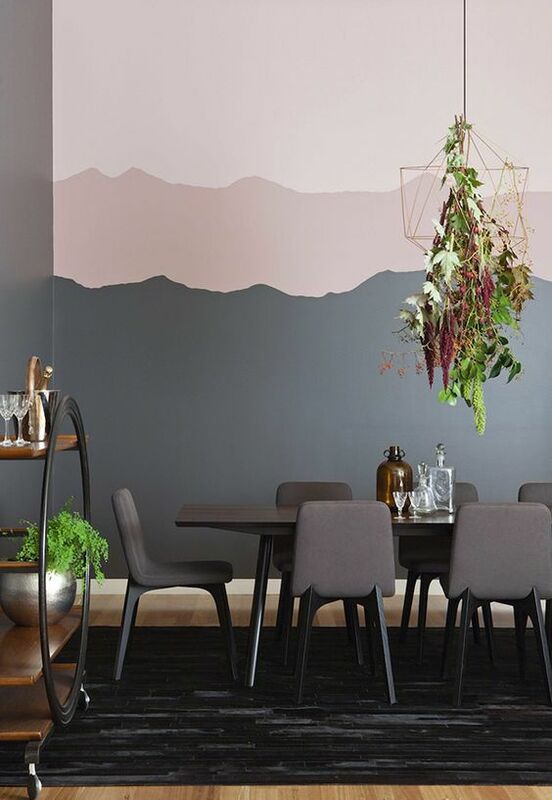 If you need more inspiration, you can always follow our pinterest board on walls. 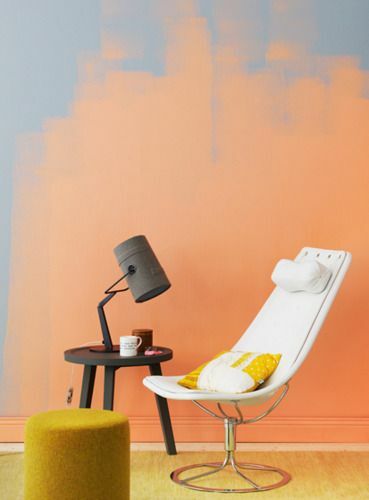 Do you need some more colour tips? 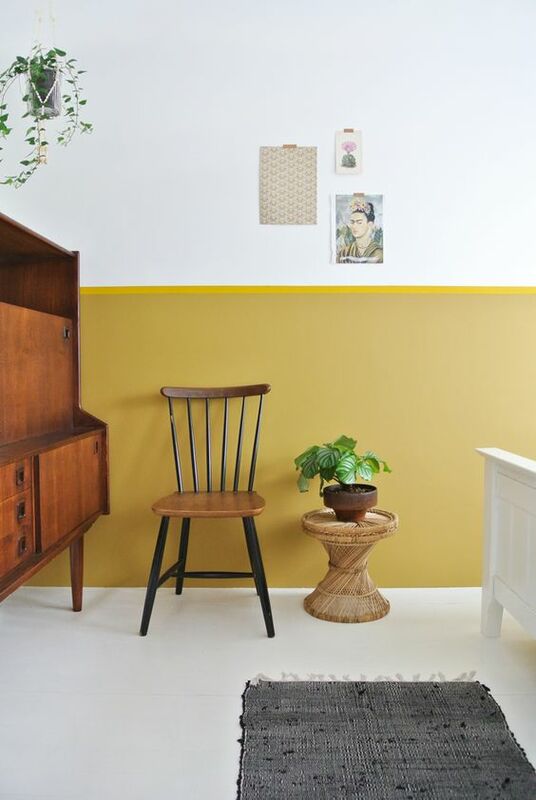 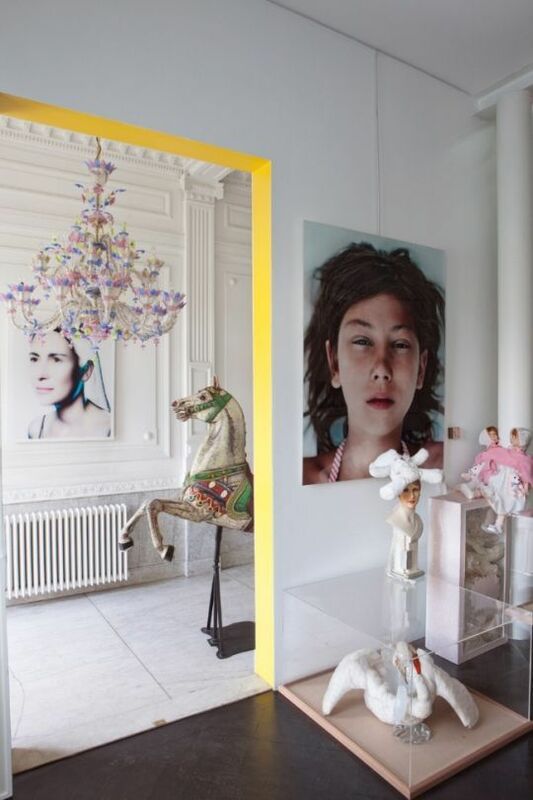 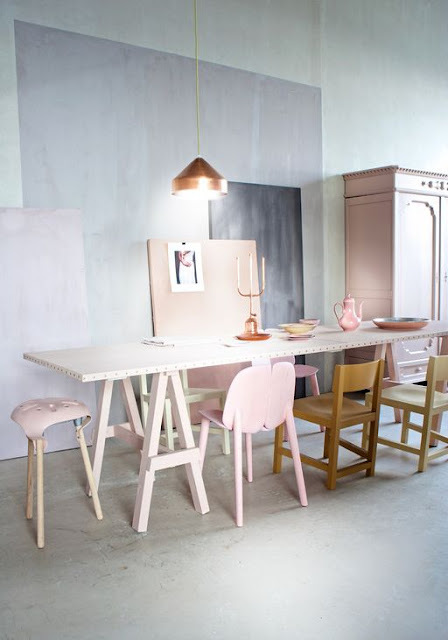 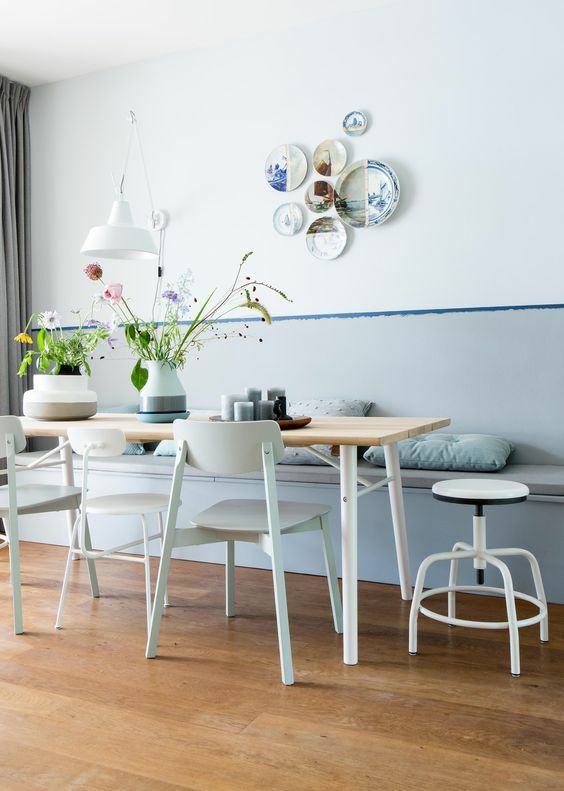 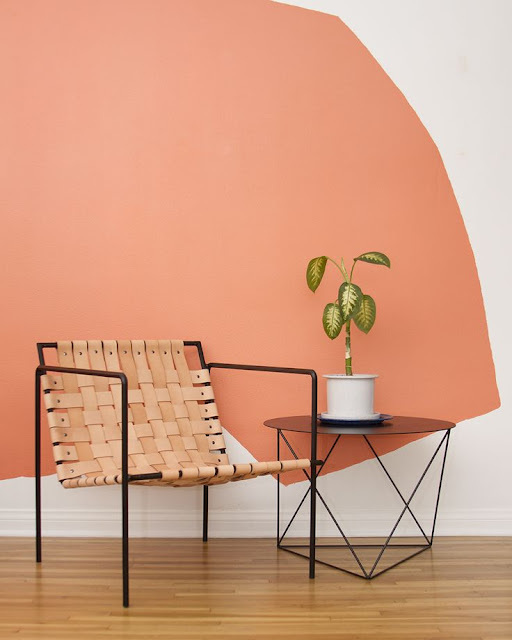 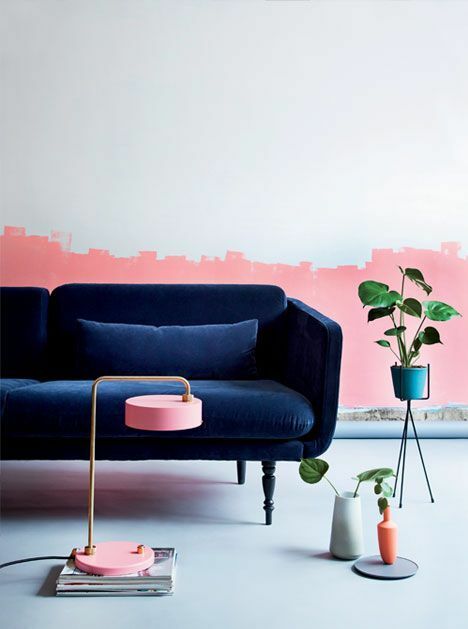 You can check our post on pastel colours or our post on intense, dark colours (written in Dutch) We did a post on spicing up your walls before, so for more ideas check this post.